Samsung has officially unveiled its newest flagship devices, the Galaxy S8 and S8+, and they're both set to revive the brand from the Note7 fiasco that took place late last year. The flagship duo is basically the same, except for the screen size and battery capacity. 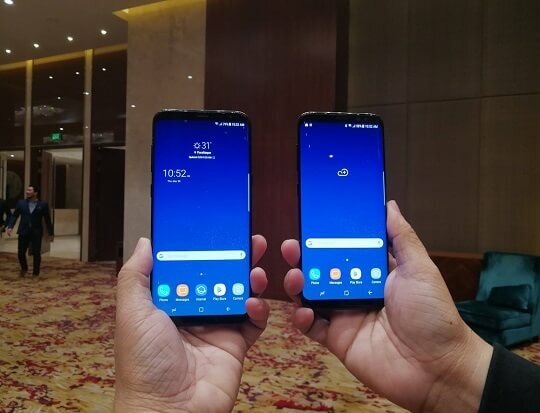 Both have Super AMOLED displays, with the S8 sporting a 5.8-inch screen with 3000mAh battery and the S8+ flaunting a large 6.2-inch screen and bigger 3500mAh battery. Speaking of display, Samsung got really innovative with these latest offerings, as they both boast a stunning Infinity Display that breaks free from the confines of bezels. In addition, the home button is already embedded at the bottom of the screen, where it stays hidden until needed. Both phones are rated at IP68 and protected by Corning's Gorilla Glass 5, as well. A new button on the left side of the duo will take you straight to Samsung's newest virtual assistant Bixby. It is integrated into every aspect of the phones so it can handle all the tasks you normally do. In terms of camera performance, the Galaxy S8 and S8+ are equipped with a 12-megapixel Dual Pixel Sensor rear camera that is capable of capturing 4K videos. Meanwhile, located at the front is the 8-megapixel selfie camera with Smart Auto Focus. The Galaxy S8 and S8+ not only look great on the outside, but they are also pretty impressive on the inside, thanks to the Exynos 8895 and Snapdragon 835 chipsets, as well as 4GB/6GB of RAM and 64GB/128GB of internal storage. The processor and memory configuration may differ by country and carrier. The Philippines will have the 4GB RAM and 64GB storage variant. Running on the latest Android 7.0 Nougat OS, Samsung's flagship duo comes in Midnight Black, Orchid Gray, Coral Blue, Arctic Silver, and Maple Gold Colors. In the Philippines, only the black and gold will be initially released, followed by the gray one. The Samsung Galaxy S8 and S8+ are priced at Php39,990 and Php45,990, respectively. The pre-order starts on April 17 up to April 29, and arrives first week of May.